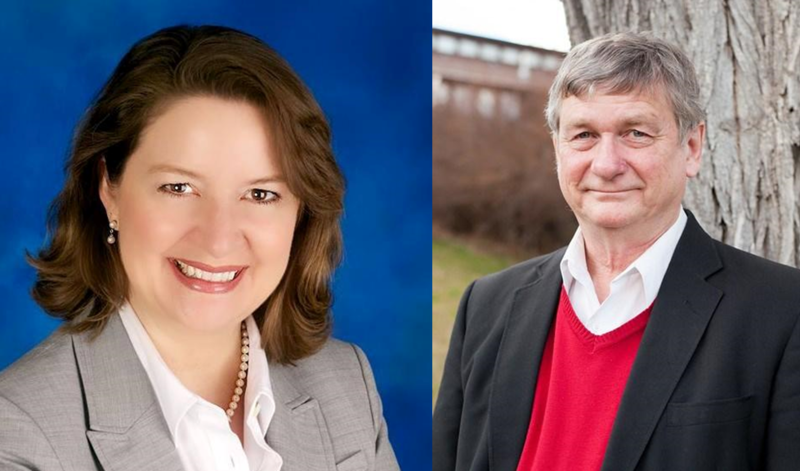 Republicans Mary Kuney and Rob Chase are competing for a Spokane County commission seat. Spokane county voters may see some interesting change among elected county officials in November. There will be a new assessor and treasurer. There will be a new District Court judge. And there’s the possibility of two new county commissioners. New commissioner Mary Kuney is running to keep the seat to which she was appointed by Governor Jay Inslee. She’s challenged by Rob Chase, the current county treasurer. The two Republicans have competed twice before for public office. In the 2014 primary, Chase defeated Kuney in his re-election bid for treasurer. And then, last year, Inslee chose Kuney over Chase for a vacant county commission seat. Because she was appointed, she has to run again this year to keep her seat. In August, Kuney won nearly 58% of the vote, Chase nearly 40%. Since they were the only two candidates running, they’re running again in November, this time for keeps. Kuney is a CPA. She has worked for the state auditor’s office. “Prior to being chosen I was the chief deputy auditor for Spokane County for two-and-a-half years. I oversaw elections and financial services for Vicky Dalton," Kuney said. She says that was good training for becoming a county commissioner. “It provided me the opportunity as directing financial services to look and see what was going on around Spokane County and what was happening, look at it from a financial perspective, but then meeting all the department heads and building that relationship with the department heads to make sure I understood what was going on in their departments and how that fed into the financial statements,” she said. Kuney says she was drawn to the public service aspect of the commissioner’s position. She has a long record of volunteer work for children’s-related organizations, including the Hutton Settlement. During her first year as a commissioner, she says she’s spent a lot of time learning about land use issues, but she says she has other priorities as well. Kuney says she opposed the new state law that requires Spokane County to expand its board of commissioners from three members to five, beginning in 2022. “I feel like the citizens voted it down in 2015 and I can say I was one of those who voted against it in 2015. For the state to then come back and say know better than our citizens bothers me as a citizen. It bothers me as an elected official when I’m trying to reach out to my constituents and do what they want to have happen,” she said. The current system allows voters to pick commission candidates in their district in their primary, but then vote for commission candidates in all districts in November. The new law specifies voting by district in both elections. “I get to vote for all three commissioners. In this scenario, I would only get to vote for one commissioner who’s then potentially raising my taxes, making land use issues and making lots of decisions that affect my daily life, but I can only talk to one commissioner,” she said. Kuney says the new system encourages representatives who look out only for the citizens of their own district and doesn’t allow for commissioners who are elected to represent the whole county. Mary Kuney’s opponent is county treasurer Rob Chase. Why does he want to be a commissioner? One thing he’s particularly proud of is working with local legislators to change a state law that allows county treasurers to accept partial tax payments any time of the year. He says he enlisted some of those people during his three-year campaign to change the law. Rob Chase’s political views sometimes run to the libertarian minimal government model. He was a supporter of Ron Paul, former Libertarian Party candidate for president. With that in mind, Chase says he’s not looking to dismantle the social safety net. “We have to help the helpless. That’s something I want to look at, community services and how many people really need that kind of help and talk to the people that are in there. They see a darker side of life than I do, so I’m sympathetic to them. There should be a safety net," he said. Rob Chase and Mary Kuney are two Republicans running for Spokane County commissioner.